HOMESTEAD, Fla. – Rookies Kyle Kirkwood and Rasmus Lindh laid down a marker over the past two days by posting the fastest times among 23 drivers from the Cooper Tires USF2000 Championship Powered by Mazda who took advantage of the annual Spring Training test on the 2.21-mile Homestead-Miami Speedway road course. A strong field of rookies and series veterans proved to be very closely matched. Kirkwood, 19, from Jupiter, Fla., driving for Cape Motorsports, set the fastest time of 1:23.7723, an average speed of 94.972 mph, to edge Swedish rookie Lindh’s best for Pabst Racing at 1:23.9236. Both times were set on Saturday in marginally cooler conditions. Kirkwood, who won last year’s U.S. 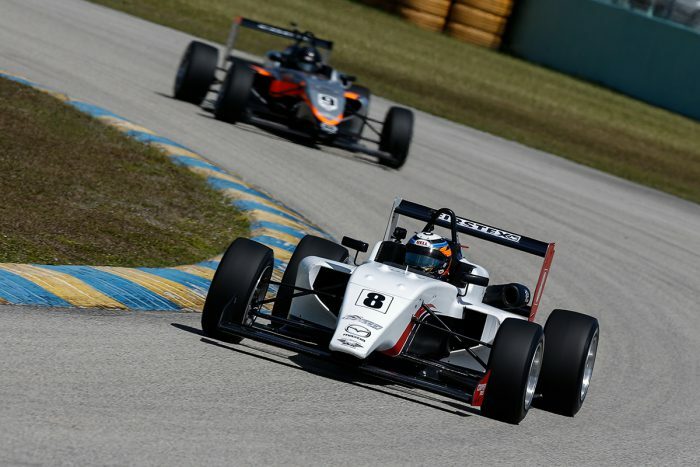 Formula 4 championship with Cape Motorsports, only concluded his deal to remain with the Florida-based team – which has won each of the last seven USF2000 championships – within the past two weeks, yet was immediately up to speed as he posted the fastest time in three of the six one-hour sessions. Kirkwood’s best time was set in the final session on Saturday, although he cemented his intentions again today with a best time of 1:23.8843 this morning. Fellow rookie Lindh, 16, from Gothenburg, Sweden, who will be undertaking his very first season of car racing, proved to be a fast learner. He set his fastest time in the very first session, clearly drawing from the experience of Pabst Racing teammates and series veterans Kaylen Frederick, Lucas Kohl and Calvin Ming. Frederick, 15, from Potomac, Md., who finished fourth in the championship as a rookie in 2017, sprung to prominence in the final session this afternoon when everyone was running on fresh Cooper tires. His time of 1:24.101 was fractionally slower than his best on Saturday, but it was enough to top the charts by a relatively large margin of 0.2950 over teammates Lindh and Kohl, from Brazil. Kory Enders (DEForce Racing), from Warwick, N.Y., rounded out the top five overall ahead of Ming, from Guyana, South America; rookie Kyle Dupell (Team Pelfrey), from Portland, Ore.; Jose Sierra (DEForce Racing), from Mexico City, Mexico; Darren Keane (Newman Wachs Racing), from Boca Raton, Fla.; and Julian Van der Watt (Team Pelfrey), from Cape Town, South Africa. The 14-race season and quest to win a $325,000 Mazda Scholarship and ensure graduation onto the next step of the Mazda Road to Indy Presented by Cooper Tires open-wheel development ladder, the Pro Mazda Championship Presented by Cooper Tires, in 2019 will commence in just over 10 days’ time when the teams and drivers reconvene on the streets of St. Petersburg, Fla., for the Cooper Tires USF2000 Grand Prix of St. Petersburg Presented by Allied Building Products on March 9-11 in support of the Verizon IndyCar Series.